Aylesbury performed a classic smash and grab raid on Saturday by scoring late and snatching all three points in a fine 1-0 home victory over promotion-chasing Marlow at the SRD Stadium. At best, the mood of the game was feisty as challengers flew in from all angles, but despite the robust nature of the visitors, the home team scooped the points thanks to Ty Deacon’s late knock-out punch. With results elsewhere also going their way, David Haule’s Moles are now eight points clear of the drop and have those above them in their sights with seven games to go. Saturday’s contest started slowly and it wasn’t until the 10th minute that a chance presented itself with Glenn Yala scuffing off target for FC. 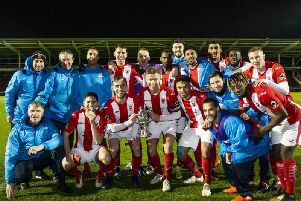 A free-kick by Aston Goss allowed Ben Stevens to turn and shoot in another half chance, while on the half-hour mark, Marcus Mealing broke into the box and only a block from keeper James Weatherill prevented the opening goal. This was to be start of an intense period of Marlow pressure. Allen Bossman saw his shot blocked by Davis Haule before Adam Richards danced into the box and took the ball around Weatherill, who recovered in time to block. Marlow’s number 10 Jordan Brown certainly caught the attention with a fiery display and he put in a lofted corner on 34 minutes with team mate Callum Gallimore heading the delivery over the bar. Another right-wing cross saw the same man make contact but the result was identical with the ball whizzing over the bar as the central defensive partnership of Stevens and Jordan Jenkins held firm. The final action of the half saw FC on the attack Goss, who’s been enjoying his football now back at FC, played in a useful ball, which Deacon was unlucky not to profit from. Mealing hit a low shot straight at the FC goal in the first attacking move of the second-half, but the next move, a flowing passing attack orchestrated by Deacon and Goss, nearly ended in the breakthrough for the home side who were growing in confidence. For Marlow, Mealing headed goalwards on 54 minutes but for the umpteenth time, his header sailed harmlessly high, while FC’s Alex O’Brien also put a header over with Aylesbury sensing an unlikely win as time ticked away. The all-action Joe Fitzgerald and the industrious Charlie Hawtin were beginning to find space to feed their attacking colleagues, and it was from one of these breaks that Deacon found himself in a great position to open the scoring. Visiting keeper Joe Driscoll stretched out a boot and blocked but on the next move, the deadlock was broken. The ball was played into the Marlow box and as the ball broke, the young striker cracked it home from all of five yards to the joy of supporters. Another header flew over the bar predictably from Gallimore as Marlow looked for an equaliser. Gallimore had tried all game to grab a goal but deep within injury time, he caught the referee’s attention for all the wrong reasons. The referee saw a deliberate elbow to Fitzgerald, giving the Marlow man a red card and with that went Marlow’s chances of a point. Now on a run of three wins in four games, FC head into fixtures at the current bottom two in buoyant mood. On Saturday, they visit basement side Petersfield Town, who have just nine points and one win this season, before going to Histon next week.